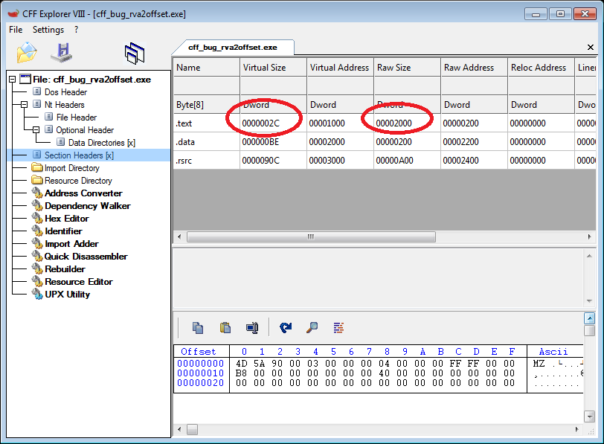 x64dbg is (probably) the most user-friendly x64 debugger right now. It's pretty, it's open-source and it usually works. But I find it very hard to switch from WinDbg to x64dbg for several reasons. Some of them are purely emotional (don't worry, I'm not going to bore you to death explaining those) but most of them are technical and related to the way x64dbg is being developed. Both DNSpy and x64dbg suffer from this disease. They love to use the "latest and greatest" of technologies, meaning Visual Studio 2017, .NET 4.6 and what not. 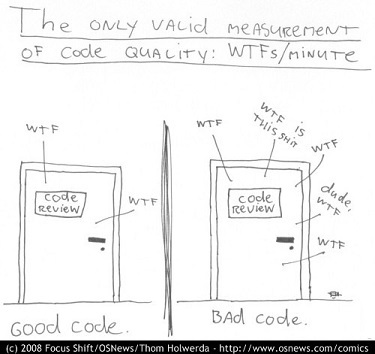 That's perfectly fine when you're writing normal software. But debugger is not a normal software. If I have a customer with a software crashing on his production servers, I can't tell him "You need to install Windows 7 SP2 and 3 different VS redistributables and reboot your machine twice just for me to run my debugger". No, I really can't. Debugger must run on any and all systems out-of-the box. Olly does that. WinDbg does that. And it wouldn't be hard to link x64bdg with static VS runtime libs and target WinXP while using all the modern goodies. But for some reason it's not done that way. These are really wise words and Olly is designed that way. 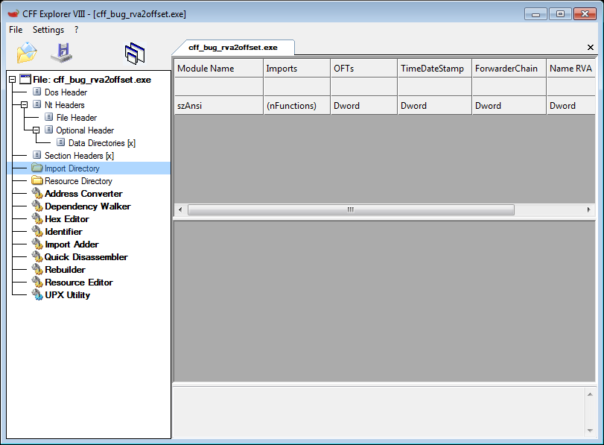 It does all the basic stuff and has stable SDK that enables plugin authors to implement all the extras. For example, why does a debugger need 3 (yes, three!) different assembler engines? Yes, Mr. eXoDia, you're right. It is useless for everyone but few people. The commands plugload and plugunload have been added. 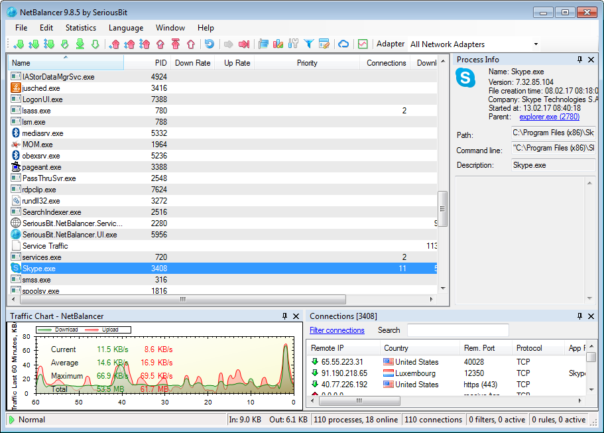 This is useful for plugin developers who want to test plugins without having to restart x64dbg all the time. How many people in the entire world will actually benefit from that? 5? 10? So, why add such bloat? Once you add something, that something must be maintained. And it's very hard to remove stuff later, as it might break something else. So, please don't.. When I am on a job and need to debug something, last thing I want to spend my time on, is fighting with debugger bugs. And my customers certainly don't want to pay me for doing that. 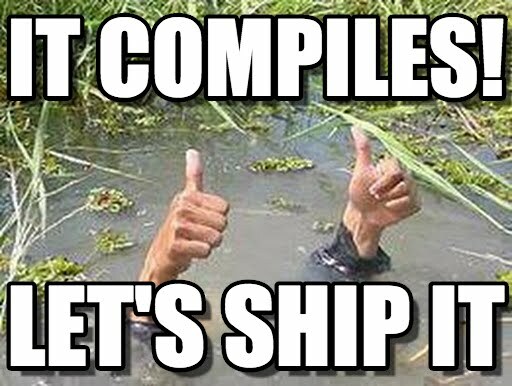 Frequent commits like "Fixed search for constant references", "Fixed intermodular calls in module", "Fixed FS/GS memory branch destinations" is not something you want to see in any software, let alone a debugger. Well, it wouldn't matter much, if there was some known-stable version I could put in my tool collection and use it anytime anywhere. 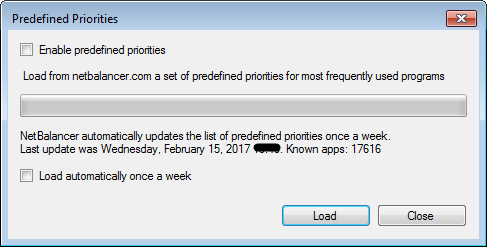 But no, Mr. eXoDia thinks that "No more excuses to not update every day!" is a way to go. Instead of using tried-and-tested version, I should use a probably buggy and unstable one? Dafuq? So, those are my 3 biggest complaints about x64dbg. I'd love to love x64dbg. 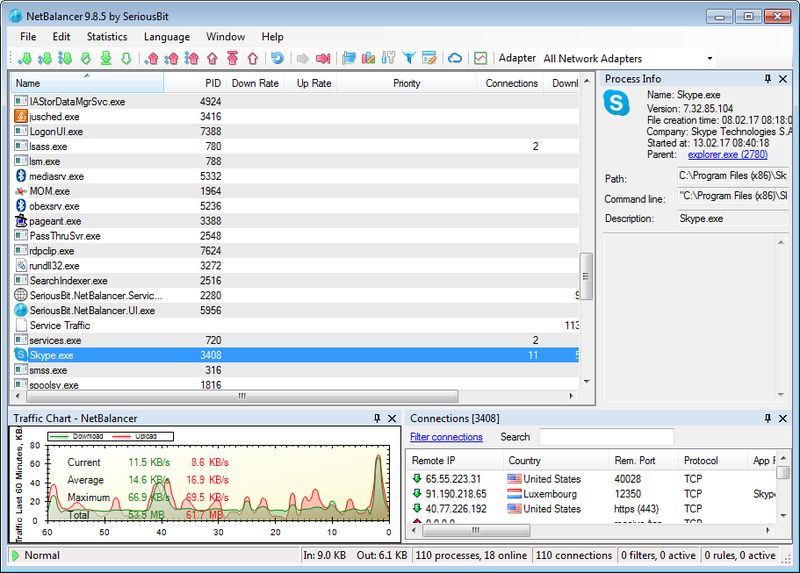 I'd love to use x64dbg for everything. But right now I just can't. Hi, I'm back from vacation. And now I'm catching up on all the things that have happened during that time. 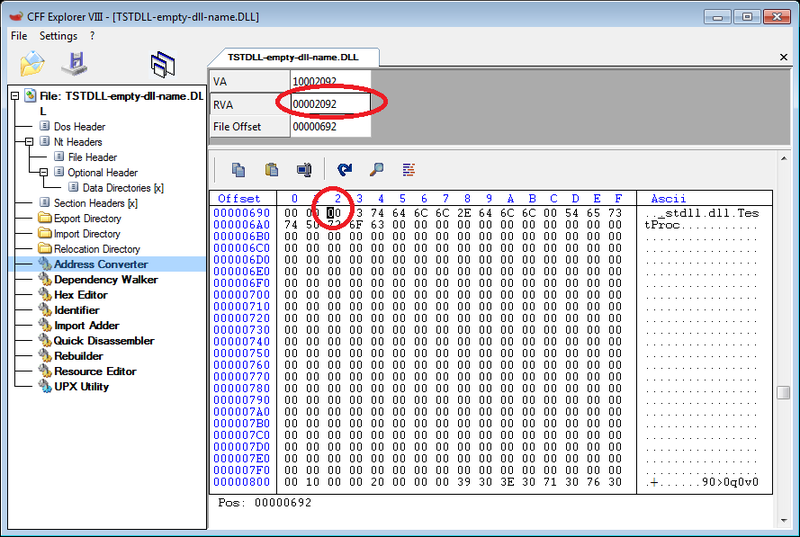 So, here's a short writeup regarding publicly-known IDA bug and how it will (not) affect reversers. It was supposed to be a long post showing how to use PatchDiff to locate patched code and then backport it. But, as you'll see later, that's not necessary at all. Maybe another time.. Using the exported functions by ordinal meant the exported function name was unnecessary, which allowed the developer of this DLL to leave the names for the exported functions blank ... 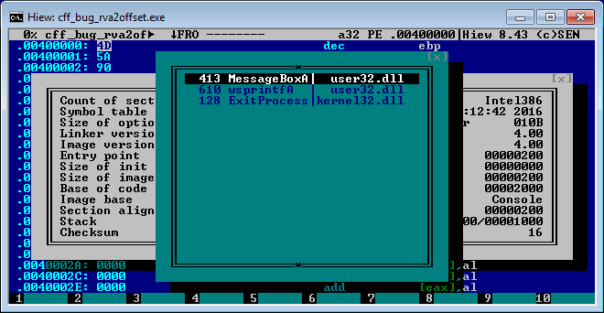 The less obvious reason is that it takes advantage of a bug in the popular IDA disassembler that was recently fixed in the latest version of IDA. Bug in IDA?! How nice, I want to test this! 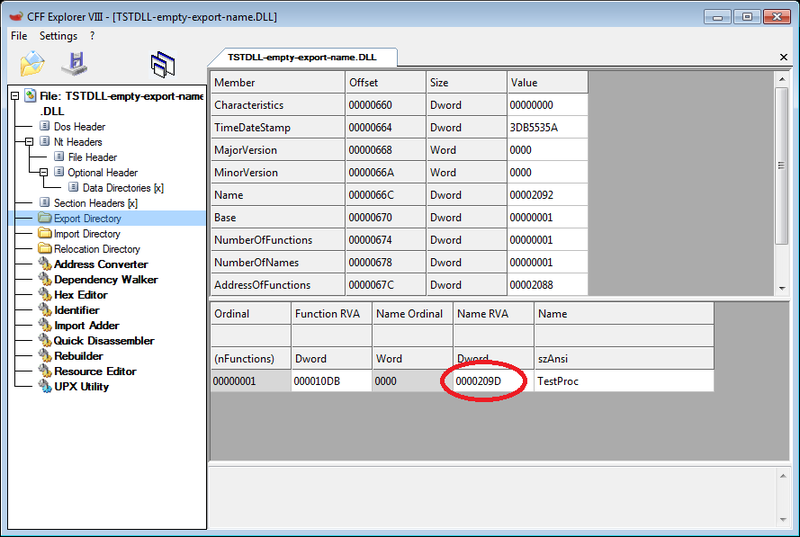 Armed with the detailed description, I used MASM32 package and their Examples to build a DLL file. First, I took hex editor and changed DLL name in export directory. Now the exported DLL name is 0-length string. Let's see what IDA does.. 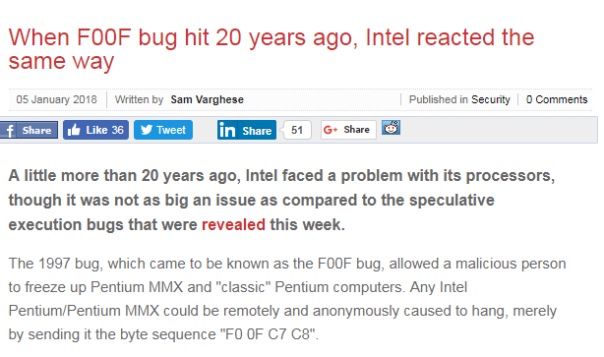 Naturally, I wanted to see how old this bug is. 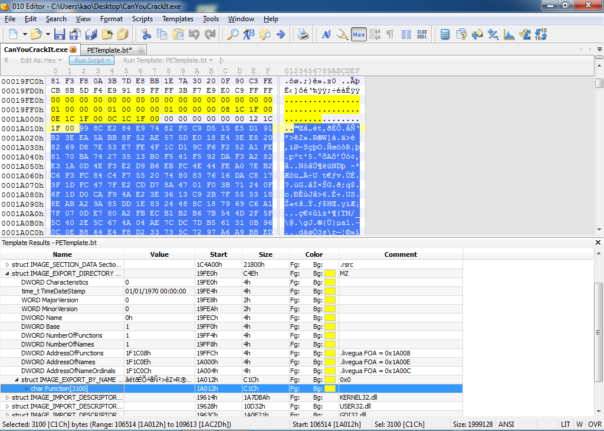 So, I took a copy of IDA 6.80. Surprise, surprise, it's not buggy! 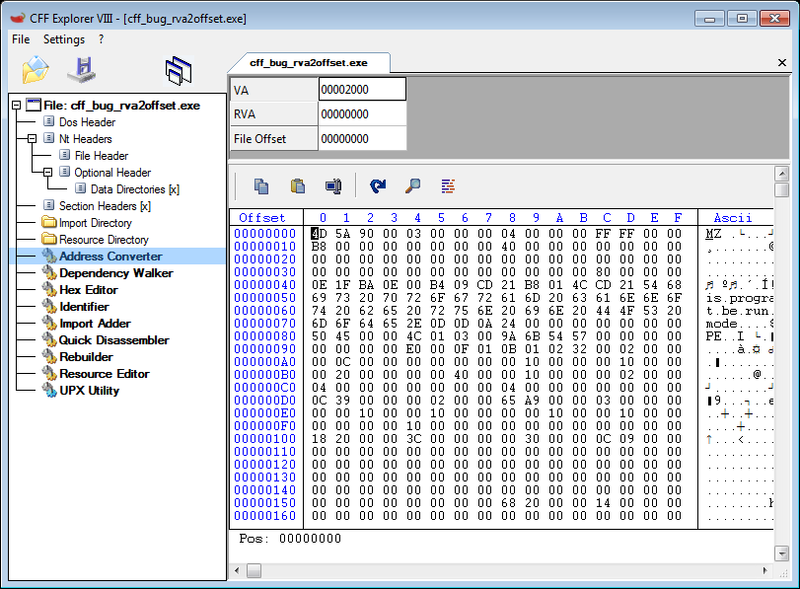 So, it looks like this bug was introduced in IDA 6.90. For completeness sake, I repeated the experiment with empty exported API name. 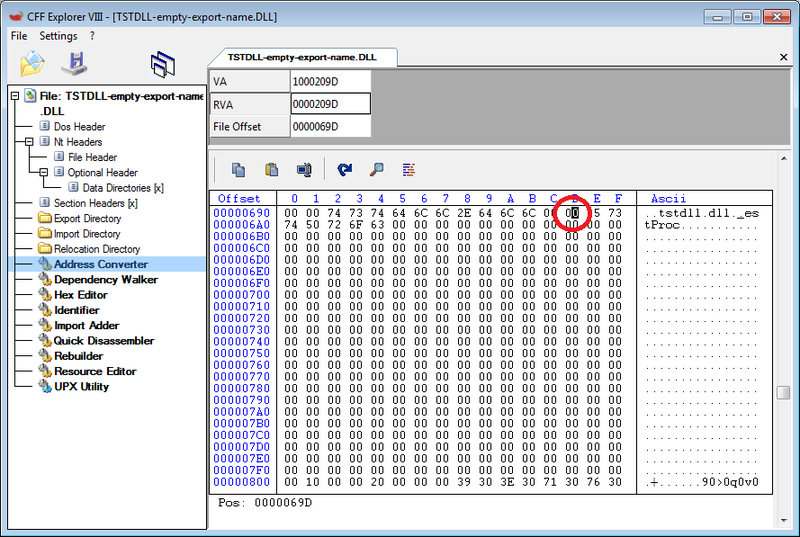 The results were identical, the bug is only present in IDA 6.90. 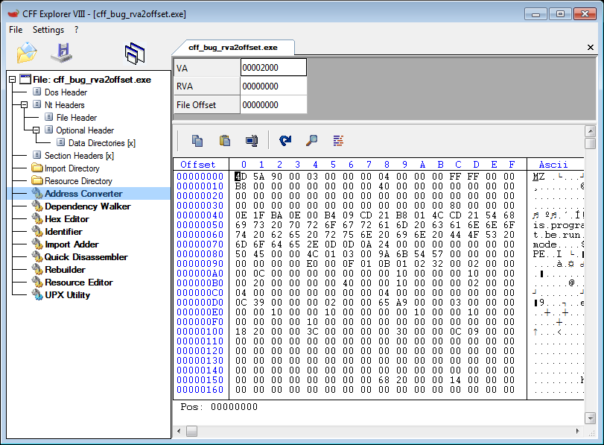 If you're using IDA Free, latest version is 6.95. You're good. If you're using legit IDA, you have received the updated version 6.95. You're good. 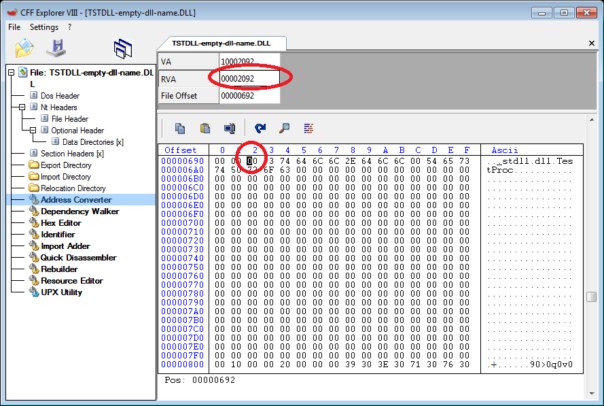 If you're using the latest publicly leaked version of IDA (6.80), it didn't have the bug. So, you're good, too. 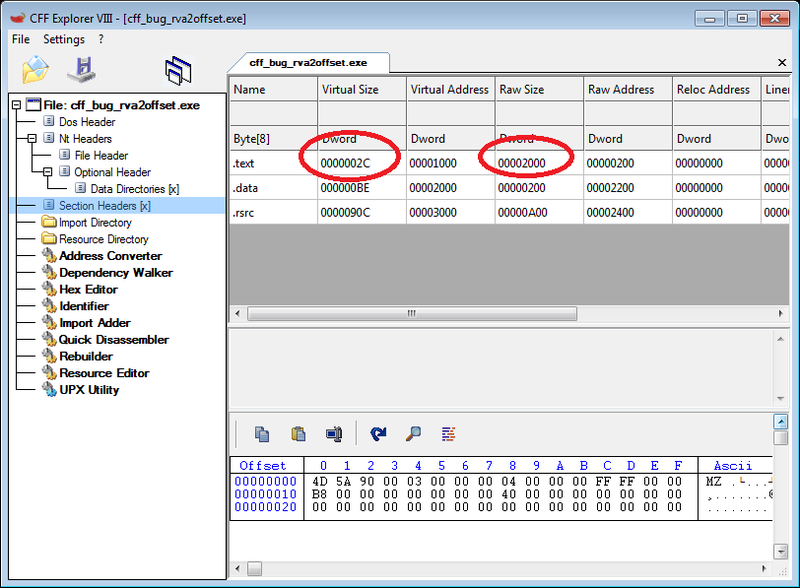 Today, I'll describe an issue with CFF Explorer's RVA2Offset function and provide a solution to the problem (patched executable). If you open it in CFF Explorer and try to check Import Directory. In this case, CFF will show that it's empty. In other executables, it can get stuck into eternal loop or - even worse - show incorrect data. Nitpickers corner: it's actually more complicated. 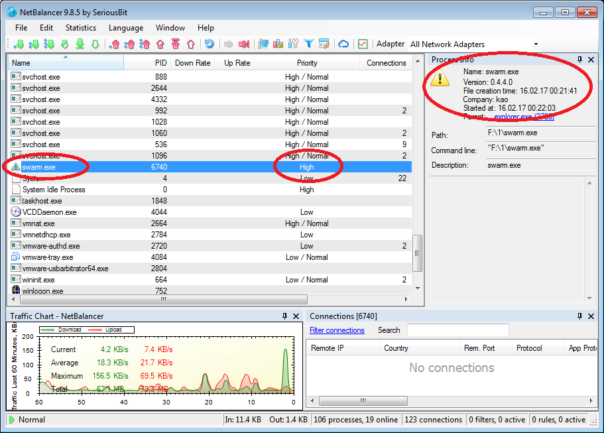 The exact condition is ALIGN_UP(sec.SizeOfRawData, pe.FileAlignment) > ALIGN_UP(sec.VirtualSize, pe.SectionAlignment). But who cares about those small details, anyway? // try to calculate how much data this section actually contains. This goes wrong, if physical size > virtual size. // calculate how much data this section actually contains. While it doesn't look like much (and it doesn't cover edge cases, for example, when PE file is truncated), in general it should work just fine. It also includes all my previous fixes. Obviously, I can't fix them all. 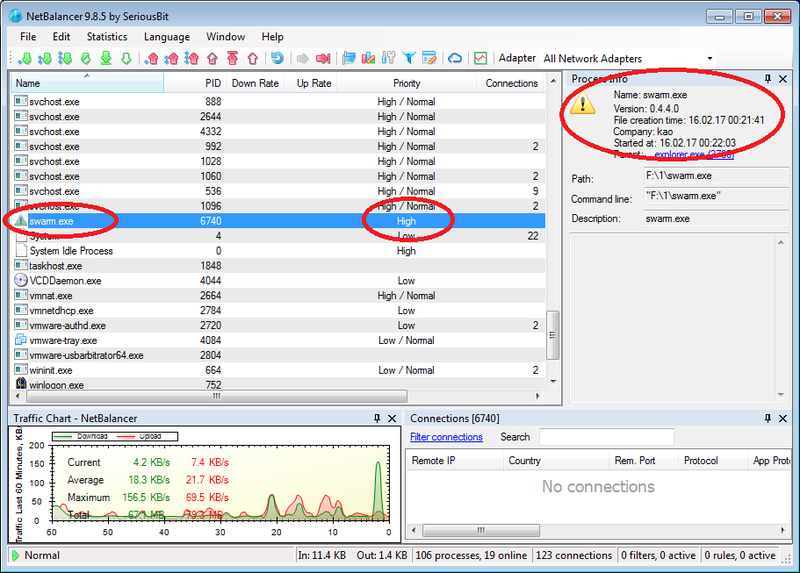 All I can say - use PE editing/viewing tools that actually work, for example, HIEW or IDA. And when you're writing your own PE parser library, make sure you test it on weird executables. The methods you call can get different parameter values than you passed in. So, if you have installed VS2015 on your PC, better disable the fancy modern RyuJIT now - and hope MS releases a proper fix soon.